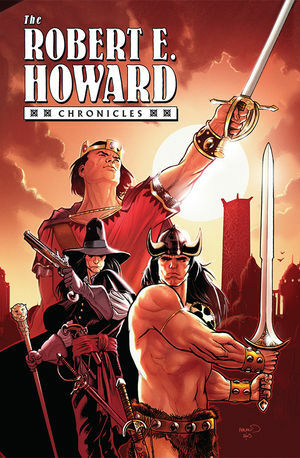 For the first time, Robert E. Howard?s most-celebrated creations are together in one handsome collection! Experience all of Howard?s most exciting tales as told by the industry?s finest creators -- including Roy Thomas, Barry Windsor-Smith, Howard Chaykin, Mike Mignola, the Severins, and more! Featuring the latest in coloring technology, the remastered comics are a perfect introduction to the Robert E. Howard universe and a refreshing refurbishment of these timeless yarns for the collector who already owns the classic comics from the ?70s and ?80s! * The Chronicles of Conan Volume 1 reprints issues #1 through #8 of the original Marvel comic-book series and includes the classic ?Tower of the Elephant? tale and the work of the incomparable Barry Windsor-Smith! * The Chronicles of Solomon Kane collects every color appearance of Solomon Kane from his years at Marvel: Marvel Premiere issues #33 and #34 and the six-issue miniseries The Sword of Solomon Kane. * The Chronicles of Kull Volume 1 features the work of Bernie Wrightson and includes Monsters on the Prowl #16, Creatures on the Loose! #10, and the first nine issues of Kull the Conqueror!